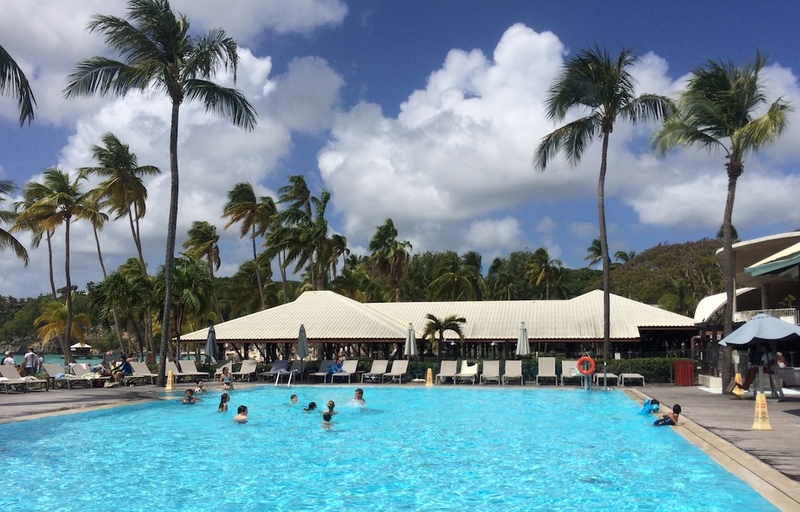 Now that the affordable Scandinavian low-cost carrier has left the island again and we are once again getting used to the quiet life after Norwegian Air, it’s time to answer that burning-hot question: How can you fly to Guadeloupe now? What are your options if you want to travel from the US to this beautiful French Caribbean paradise? Well, the easiest and cheapest solution is to wait until next winter. Norwegian seems to already be selling flights to Guadeloupe from New York and Fort Lauderdale, starting Nov. 1. So I guess that means they are coming back here for their fourth winter! Woohoo. And the prices are looking great, as usual. Roundtrips from JFK go for around $210. There’s no news yet about any Boston/Providence or Washington D.C. area flights coming back, but we shall see. But yes, I’m aware of the fact that some of you don’t want to wait until November to come to Gwada. Maybe you are a teacher and have the summers off to travel, or maybe you’d like to escape the spring snowstorms that are taking over the Northeast. 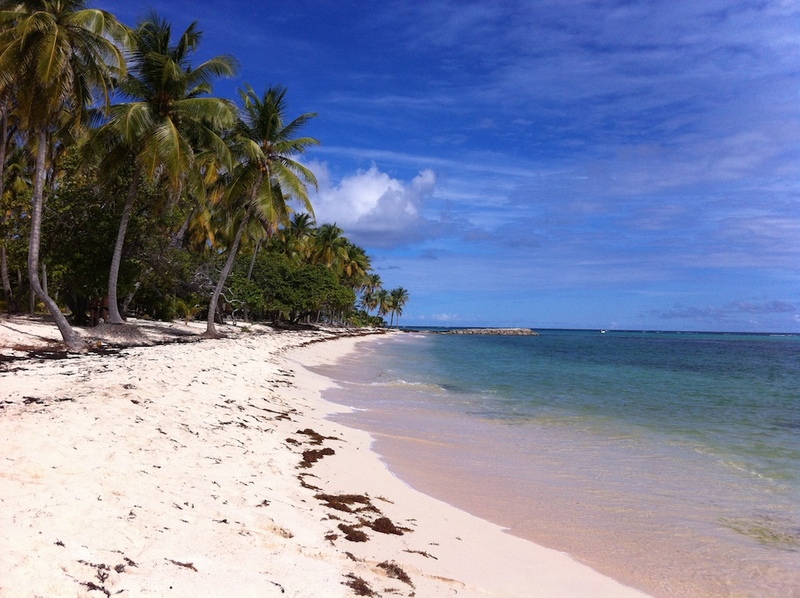 Or maybe you would enjoy traveling to the Caribbean during low season so you could have the beach to yourself. Or maybe one of your best friends is having a baby in Guadeloupe and you simply can’t wait to see the little one! Well, the good news is that there are certainly a couple of ways to come to Guadeloupe between now and November. Let me show you the three flight connections that currently exist between the continental USA and Guadeloupe. Low season perks – an empty beach to call your own. Last fall we received the big news that Air France was adding a direct flight from Atlanta to Guadeloupe. Whoa! I guess they figured Norwegian had found a good niche and wanted their own piece of the pie. So these direct Atlanta-Guadeloupe flights started in November 2017 and are still going on. There are currently flights from Atlanta to Pointe-a-Pitre on Wednesdays and Sundays, and the return flights from PTP to ATL fly on Tuesdays and Saturdays. The flight is just over 4 hours long. As Air France is a partner of Delta, you can book these flights either via Air France or Delta. And the prices aren’t bad either! You can get a return trip from Atlanta to Guadeloupe for as low as $330, which is not too far off from the Norwegian prices (and this includes 50 lbs/23 kg of luggage if you book it via Air France, and also some food on the flight). The downside is that if you are not based in Atlanta, you would need to fly into the city from elsewhere and that would most likely increase the costs, and surely add several hours to the flight time (or even require an overnight layover in ATL). Also, these Air France flights seem to dwindle down to one per week each way in July and then disappear altogether after Sept. 5! So if you are looking to fly from Atlanta to Gwada, you’d better get on it before it’s too late! This is a flight connection that has existed for years – the weekly Air France flight from Miami to PTP goes via Haiti’s capital Port-au-Prince, which turns this little jump across the puddle into a 5-hour journey. The nice thing is that on the way from Miami to Guadeloupe you won’t have to get off in Haiti, you can just chill onboard the plane for an hour while the aircraft is being reloaded. However, on the way back from Guadeloupe to Miami you will indeed need to get off in Haiti and then re-board again (it will be the same plane you will continue with though). You can fly from Miami to Guadeloupe with this flight five days a week: on Mondays, Tuesdays, Thursdays, Fridays and Saturdays. For coming back, you options are to fly on Mondays, Wednesdays, Thursdays and Fridays. This flight has traditionally been fairly expensive, starting at around $600 roundtrip. Randomly the price of this flight is actually quite a bit cheaper if you start the trip further than Miami, like in New York or Boston. 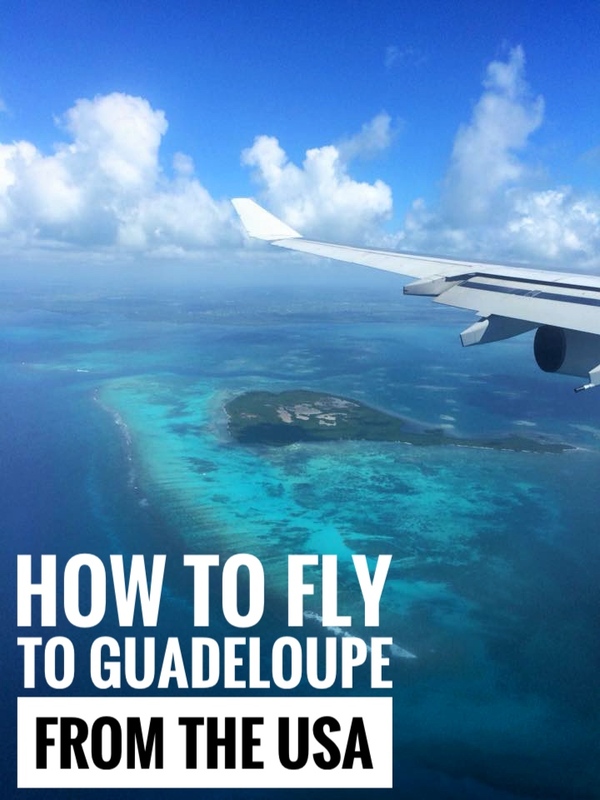 A roundtrip from NYC to Guadeloupe via Miami with Air France can thus be more like $400-500, but your total travel time often comes to about 24 hours due to all the layovers. Yikes! This sure makes me miss those nifty 4.5-hour direct flights from JFK with Norwegian Air! While Air France is a partner of Delta, for some reason you cannot book this Miami-PTP flight through Delta’s site. You will need to go on Air France’s site or to book it through an OTA (Online Travel Agency) like Orbitz.com or Expedia.com. You can also book it via Air Antilles, a French airline serving the Caribbean that is a codeshare partner of Air France. This weekly American Airlines flight from Miami to Guadeloupe typically goes only on Saturdays, and is run by Republic Airlines operating as American Eagle. Republic Airlines uses a pretty small regional jet, Embraer 175, on this route so there will be a max of about 70-80 passengers onboard. The flight time is 3.5 hours. Right now the roundtrips from Miami start at $364, so this can be a fairly economical choice if you are based in Florida and can be flexible enough to only fly on Saturdays. If you want to start your trip in New York and catch this AA flight from Miami to PTP, the price of the roundtrip starts at $675. Also, during July and August these flights from Miami to PTP are priced at over $1,400 for some reason (!) so that is pretty cray-cray. But I suppose even these prices will become a bit more reasonable once it gets closer to summer. Club Med stays open through the summer, but closes for Sept/Oct. As you can see, coming down to Guadeloupe from Miami is fairly easy year-round even without Norwegian (although not as cheap – Norwegian has prices as low as $135 roundtrip from Fort Lauderdale!). But flying down here from other places in the US, like New York, can be a struggle. A friend of mine just booked roundtrip flights from JFK to Gwada for June for $510 and the trip includes five separate flights and two overnight layovers! Whoa. So you gotta have some real dedication to come over here right now. And yes, this certainly makes us appreciate Norwegian big time! When we flew down in February, we flew from Chicago to San Juan. Overnighted in San Juan and then flew Air Antilles to PTP. While a little more time consuming than direct flights from the states, it did add a little adventure to our trip! Yes, flying to Gwada through Puerto Rico and even via St. Martin or Antigua are also decent options if you have some extra time! I was just thinking of doing a post about these flights as well, as I didn’t want this initial post to get too long. Great to know that it worked out for you! Having a mini-vacation in Puerto Rico on the way to PTP is not too bad anyway. 🙂 Thanks for stopping by my blog!